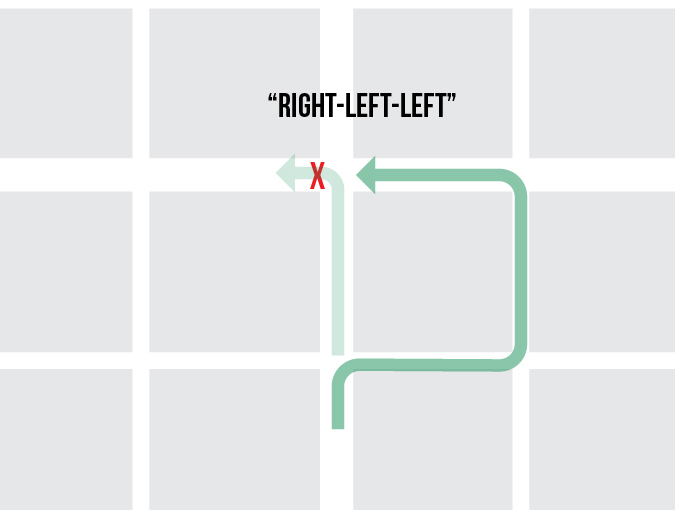 Left turns consume an especially large amount of space and signal time, while queued right turns are especially problematic for transit operations in the right lane. Prohibiting turns where they present issues, and shifting turn volume to the intersections where they can be best accommodated—with signal phases and turn lanes—can improve transit performance, general traffic performance, and walking and bicycling safety at the same time. Turning movements account for 32% of collisions involving buses and pedestrians. Two-thirds of those collisions involve left-turning buses hitting pedestrians. Kelley Klaver Pecheux, et al. 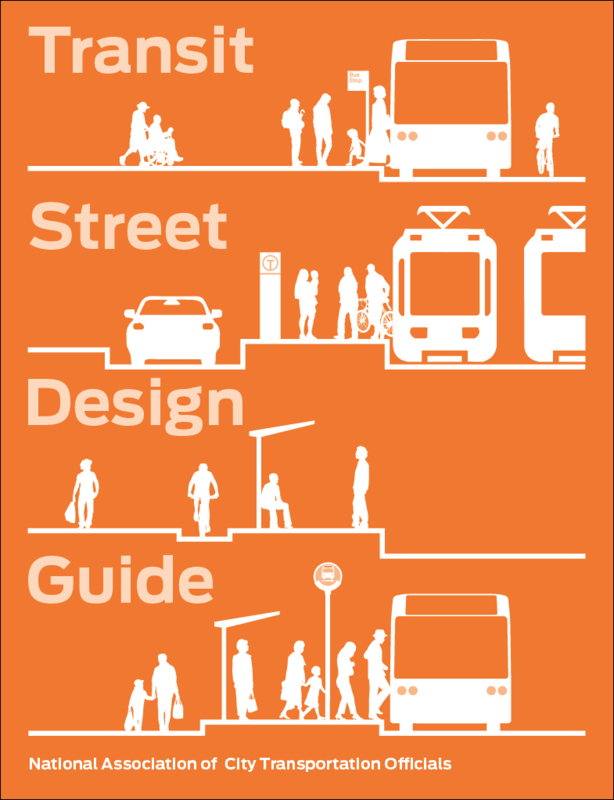 Guidebook for Mitigating Fixed-Route Bus-and-Pedestrian Collisions. TCRP Report 125, Transportation Research Board (2007). More turn management strategies can be found in the next section, Intersection Design for Transit. Turn restrictions may be applied on streets with or without dedicated transit lanes. Left-turn restrictions are broadly applicable to multi-lane two-way streets, and may be beneficial on two-way streets with one lane per direction with very high transit volumes. Left-turn prohibitions are an important component of high-capacity center-running transit services, such as center-running BRT and LRT. Streets with BRT and LRT should prohibit left turns from the transit lane, permitting them only from an adjacent lane with a dedicated turn phase. 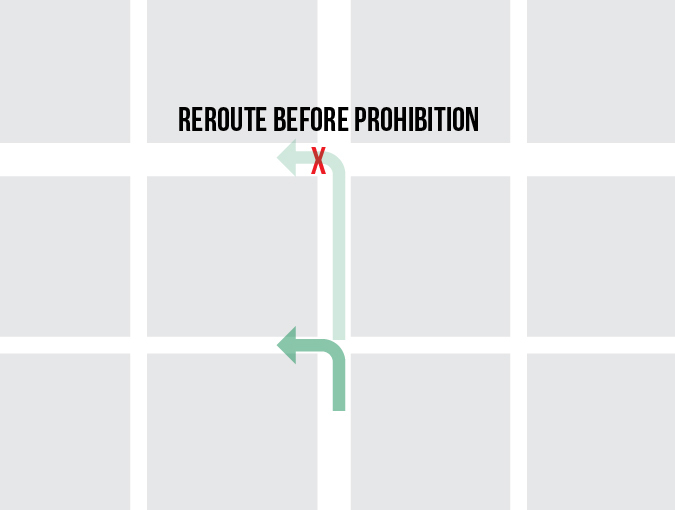 Right-turn prohibitions are especially useful for intersections in downtown areas with high walking and bicycling levels, or for streets with right-side bike facilities, where permitting turns would result in long delays for transit vehicles running in the right lane. In dense intersections for walking and biking, restricting turns, including right turns on red, has a safety benefit for vulnerable road users, but without physical design changes requires periodic enforcement. Additionally, if turns are restricted at a spot, a suitable alternative must be provided to maintain compliance. Nicholas Antonucci, et al. Guidance for Implementation of the AASHTO Strategic Highway Safety Plan, Vol. 12: A Guide for Reducing Collisions at Signalized Intersections. NCHRP 500, Transportation Research Board (2004). Turn management is required for side transitways. Bicycle turns have minimal impact on transit and pedestrian traffic, and can be permitted even where other turns are prohibited. Left-turn restrictions may substantially reduce transit delays for all types of transit facilities except one-way street right-side facilities. Left-turn restrictions may reduce the frequency of pedestrian injuries and the frequency of transit-involved motor vehicle crashes. 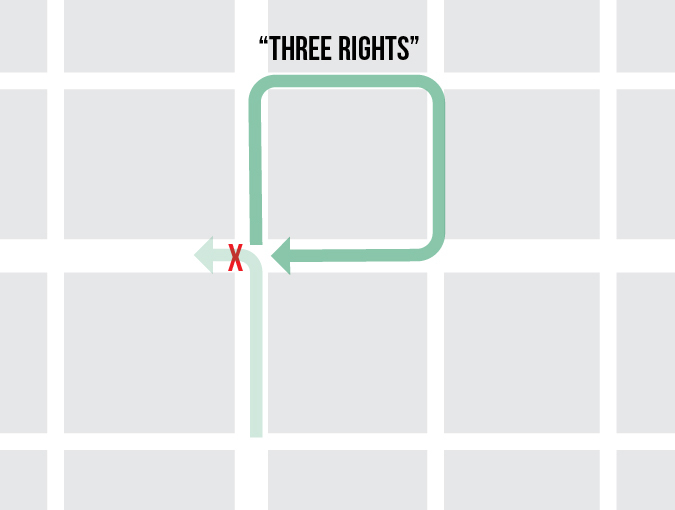 In New York, left-turn crashes involving severe pedestrian injuries outnumbered right-turn crashes 3 to 1. Additionally, pedestrians struck crossing at signals had the signal in 57% of cases. Rob Viola, Matthew Roe, and Hyeon-Shic Shin. The New York City Pedestrian Safety Study & Action Plan. New York City Department of Transportation (2010). Right-turn restrictions for curbside and offset transit lanes prevent transit delays from turning vehicles and may reduce the frequency of pedestrian injuries. On two-way streets, left-turn restrictions can substantially increase the capacity of general-traffic lanes. In streets operating at or near capacity, this may enable the implementation of a transit lane while minimizing delays and queuing for general motor vehicle traffic. Where the turn to be prohibited has a moderate or high existing traffic volume, diversion is likely to occur. 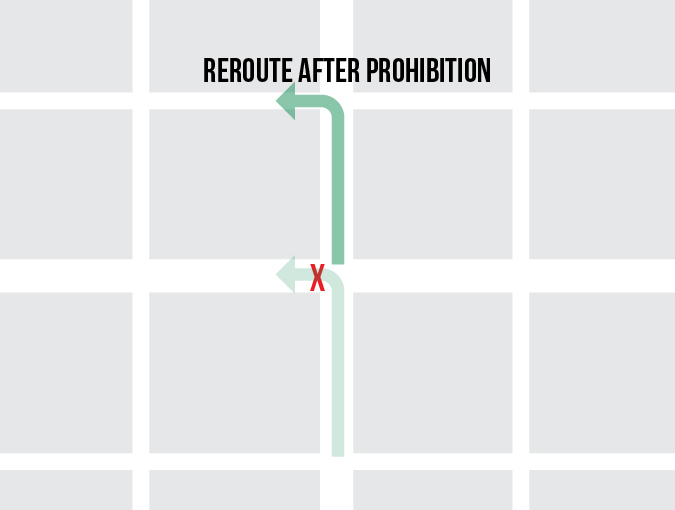 Alternate routes for the turn should be identified that would generate fewer conflicts between turning vehicles and pedestrians, transit service, and oncoming traffic. Consider network connectivity when planning turn restrictions. 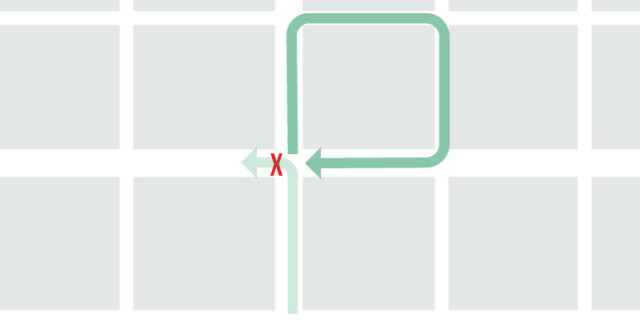 Network analysis should at minimum identify alternate paths for vehicles to access the specific block that would no longer receive a turn, considering the availability of turn pockets, general intersection geometry, walking and biking volumes, and other aspects of turns. Some diversion paths may be less desirable than the original turn, while others can be safer and more efficient with relatively simple interventions. Left-turn prohibitions may improve operations for right-side running transit operating in mixed-traffic lanes. However, right-turn volume increases must be accounted for when considering potential benefits for transit operations. Install NO RIGHT TURNS (MUTCD R3-1), NO LEFT TURNS (R3-2), NO TURNS (R3-3), or NO TURNS EXCEPT BICYCLES. Turn prohibition signs should be placed where they will be most easily seen by drivers who might be intending to turn. A NO RIGHT TURN sign should be installed adjacent to a signal face viewed by drivers in the right lane. The NO LEFT TURN (or NO U-TURN or combination No U-Turn/No Left Turn: MUTCD R3-18) sign should be installed adjacent to a signal face viewed by road users in the left lane. A left-turn blank-out sign may be installed where left turns are prohibited while transit vehicles are present. A NO TURNS sign should be placed adjacent to a signal face viewed by all road users on that approach, or two signs may be used (MUTCD §4D.34). For bus lanes with turn restrictions, a solid lane line should be marked at the approach to the intersection along the bus lane. If dedicated bicycle infrastructure is present on a street, bikes should be excepted from the turn restriction and provided with a short approach lane or other facility. If turns can be made from a previous intersection, install wayfinding signage in advance of the prior intersection. Wayfinding signage can be provided to direct vehicles to permitted turns or recommended diversion paths. Vertical separation elements or other self-reinforcing geometric design elements may be installed to prevent or discourage prohibited turns. Part-time turn prohibitions, usually applied during peak multi-modal traffic periods, are a useful tool for minimizing delays on streets without dedicated turn space. While peak-period left-turn prohibitions are a conventional strategy to increase general-traffic throughput—potentially resulting in higher traffic volumes over time—peak-period turn restrictions on left turns or right turns can substantially improve the performance and safety of either a peak-only transit lane or full-time transit lane. *Assumes one- or two-way street with right-side transit.